Los Angeles, CA– Today the Consumer Federation of America reports that Proposition 103, the insurance reform law passed by California voters on November 8, 1988, has saved drivers $154 billion on their auto insurance. The report also finds that the law has loweredauto liability premiums in California by 5.7% since 1989, even as liability premiums increased 58.5% across the rest of the country. The Consumer Federation of America credited the savings and stability of rates to the provisions in Proposition 103 that require insurance companies to justify and get approval for rate increases, allow the public to challenge unfair insurance company practices and excessive rates, and that made the insurance commissioner an elected post. Californians will elect a new insurance commissioner next month. “As voters consider twelve different measures on the ballot next month that impact everything from housing to the food they eat, they have $154 billion in proof that citizen initiatives can change the way consumers are treated and make the system fairer,” said Carmen Balber, executive director of Consumer Watchdog. 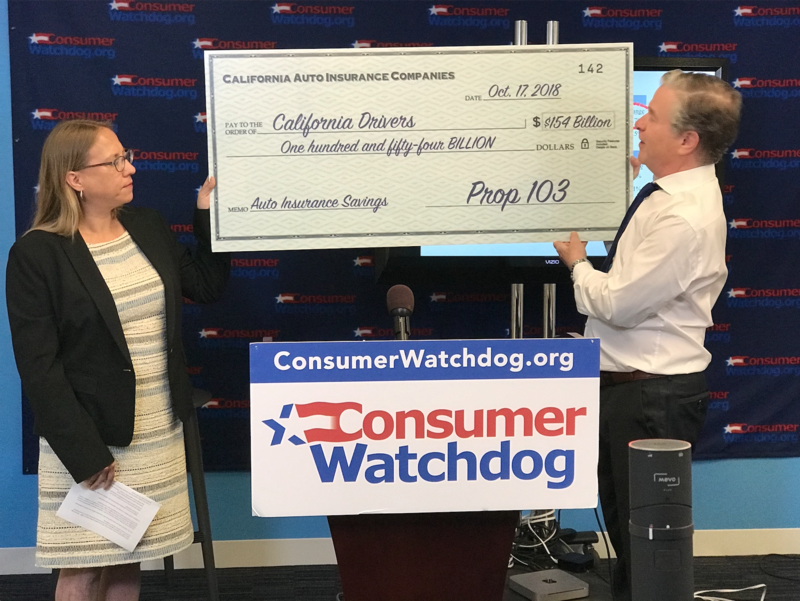 Press Conference for Prop 103 saving California drivers $154B from Consumer Watchdog on Vimeo. Californians have saved $154 billion, or $6 billion a year, since 103 took effect in 1989 compared to what premiums would have been had they followed the national average growth rate. Auto insurance liability premiums, excluding comprehensive and collision coverage, went down 7% in California since 1989; during the same period, liability premiums went up 58.5% nationwide. While the total amount of auto insurance premiums paid by motorists across the nation rose 61.1% in the same time period, the premiums paid by California motorists increased just 12.5% in California since Prop 103 passed. Californians spent just $93.48 more on auto insurance in 2015 than they did in 1989; nationwide drivers spent $352.71 more – nearly four times as much. California has the 2nd most competitive auto insurance market in the nation. By giving members of the public the ability to monitor the insurance industry’s compliance with the law and challenge unlawful insurance premiums or abusive practices before the California Department of Insurance and in the courts, Proposition 103 has enabled California consumers to protect themselves against insurance overcharges and unfair rates. Since 2003, Consumer Watchdog alone has invoked these procedures to stop $3.3 billion in unnecessary rate increases on auto, home, renter, small business and even the professional insurance that doctors have to pay. The insurance industry has never stopped its attack on Proposition 103. Its lobbyists have sponsored countless bills in Sacramento to repeal parts of Proposition 103, sponsored two ballot initiatives to undo Proposition 103 protections, and continuously challenged the law in court. All of these attacks on 103 have been defeated. The battle continues to this day. There are currently five proceedings in court and at the Department of Insurance to defend and enforce Proposition 103. The Department of Insurance is holding two public inquiries as to whether Farmers and Allstate are using illegal rating factors to discriminate against drivers. Proposition 103 was passed by California voters on November 8, 1988. Insurance companies filed over 100 lawsuits to block Proposition 103 from taking effect. In May, 1989, the California Supreme Court unanimously upheld all major provisions of the law. 103 forced insurance companies to pay over $2 billion in refunds for overcharges between 1987 and 1988. Proposition 103 requires that auto insurance rates be based primarily on a driver’s safety record, miles driven and driving experience. It requires all automobile rating factors be approved by the Department of Insurance and prohibits discriminatory rating factors including credit score, ZIP Code and race. Prop 103 prohibits excessive, inadequate and unfairly discriminatory auto, home and business insurance rates and requires insurance companies to open their books and justify those rates before they are approved. 103 applied the state’s consumer protection, civil rights and antitrust laws to insurance for the first time. It also created the funded public participation process to level the playing field and ensure consumers have the resources to hire the technical experts – including economists, actuaries, geologists and attorneys – needed to go up against the insurance industry. In addition to regulating rates, Proposition 103 made the insurance commissioner’s office an elected position that is accountable to the voters. Californians will choose a new insurance commissioner this November. Consumer Watchdog is a non-profit, non-partisan citizen organization.